My seed shipment from Germany arrived today! I have three fresh packages of Otzeniana C280 to sow in the spring. I also purchased some Hallii v. Hallie, a couple different types of Terricolor, and…drum roll…Aucampiae v Aucampiae ‘Storms Snowcap’!!! Storms Snowcap is one of the cultivars I’ve been drooling over this past year so I’m excited to have some seeds in my collection. A while back I saw a picture of a little dwarf Conophytum. I was intriqued by the genus and bought myself some seeds. While doing an inventory of my Lithops seeds (yes, I have enough to warrant an inventory and more coming in the next few weeks! ), I came across the three tiny packets of Conophytum and decided to give them a go. Conophytum are rumored to be the exact opposite of Lithops in terms of growing cycles so how great will it be to have a summer mesemb and a winter mesemb! I must admit, I’m not all that confident with Conophytum yet, but it shouldn’t take long to get up to speed. I’ll be making them their own little category so it’s easy to follow their progress. In other news…I gave away my Lot #5 seedlings. If you recall, I was trying a winter sowing of Dorotheae, Aucampieae, and Verruculosa. 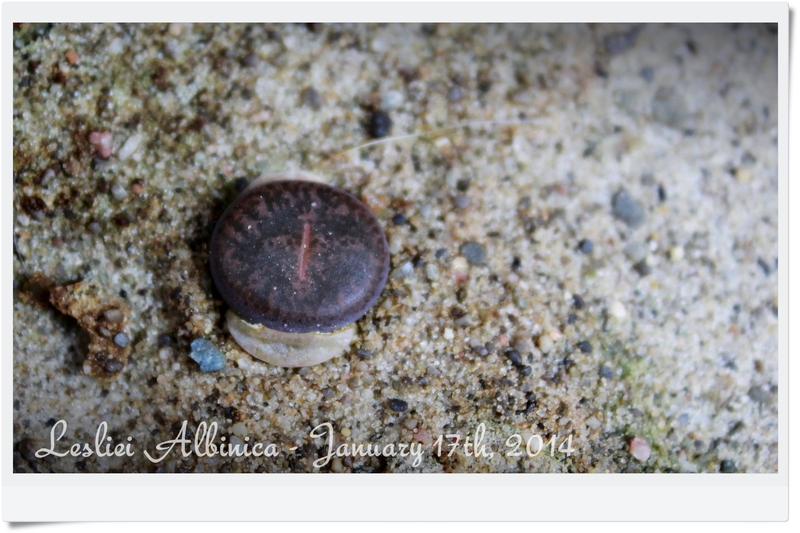 I found some like minded friends who wanted to give Lithops a try so I rehomed the little seedlings with them. I was sad to see them go but happy to ignite a passion in someone else. 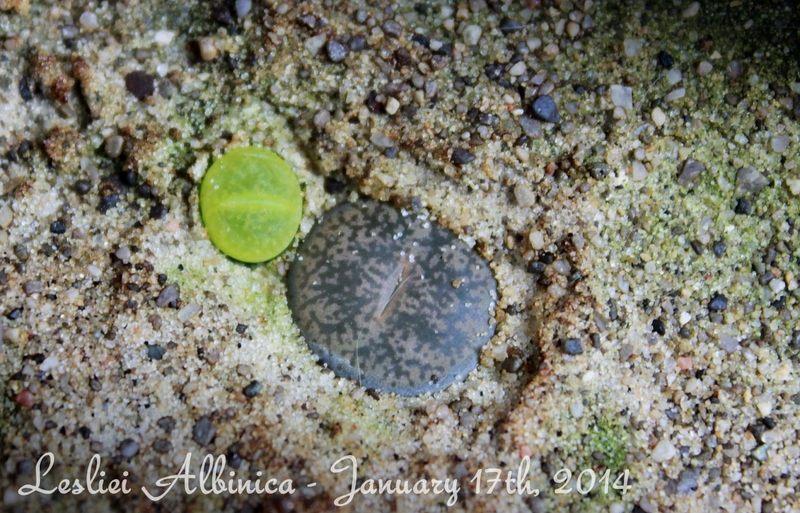 Lithops don’t have a great following in my area so it will be nice to have some other people to share my stories with and maybe even seed in the future. I think it’s been a long while since I showcased my small collection of Lesliei Albinica. They are gorgeous! I love the variety although the seeds weren’t supposed to be mixed. I have a grey one, two browns, and a five greens. The greens range in color from deep forest green to the brightest, almost impossible, electric green! I just love them. Interestingly, when the soil gets dry, they dig themselves into the sand. I think this is evolutionary and likely a mechanism to prevent them from losing too much water in the hot sun during times of drought. Neat! With the loss of my lone Otzeniana, I engaged in an extensive search for more seeds. Otzeniana is not common, but I was lucky to find some seeds in Germany and Hong Kong. Of course, I ordered them! Hopefully they arrive in good shape and I’m able to get a nice crop of Otzeniana growing in the Spring! 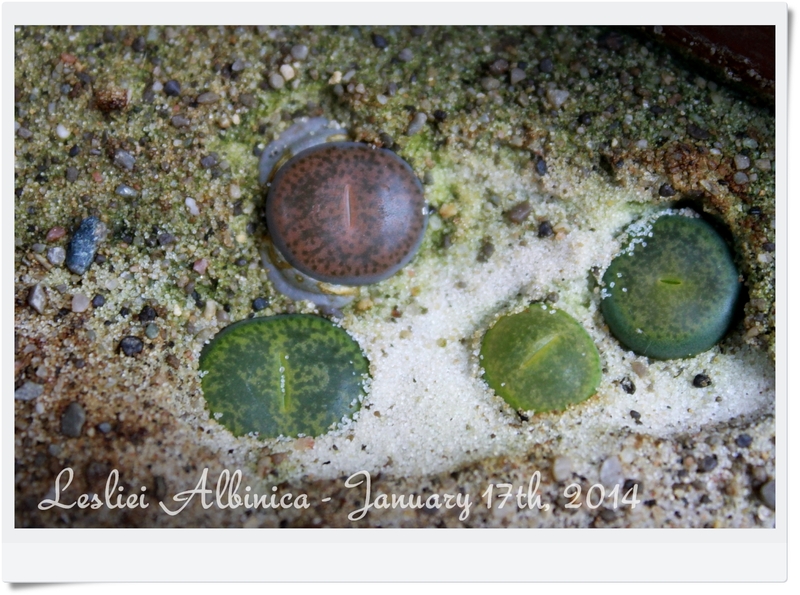 When I checked on the Lithops today, I noticed that my lone Otzeniana appeared to be starting to shed it’s baby leaves. Upon closer inspection, I realized that it was completely empty inside. I pulled it out of the soil and it had a beautiful long root, but it was very dry and appeared dead. I really scaled back on watering the seedling this winter; I wonder if I stopped watering too soon. It’s disappointing, but I will try this species again in the Spring. Hopefully, if I can get a better germination rate, I’ll have better luck bringing one or two to full maturity.